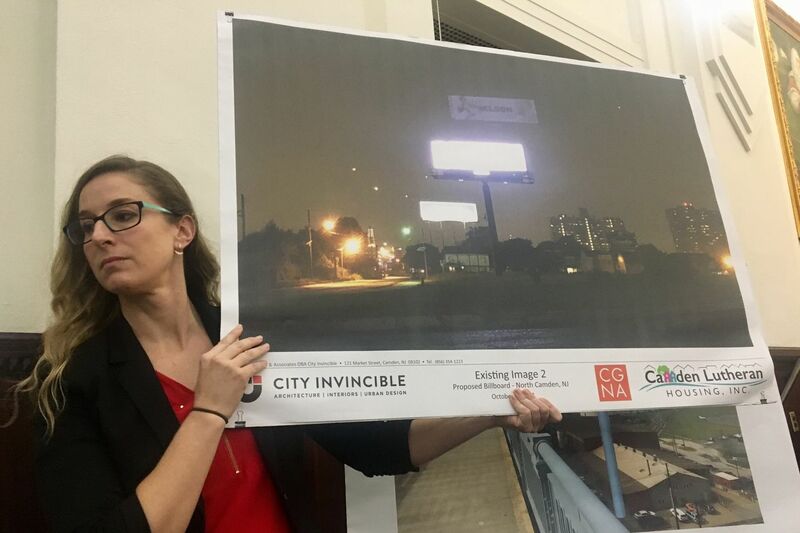 Jessica Franzini, director of Community Initiatives for Camden Lutheran Housing, holds up an example of a digital billboard. A 167-foot high digital billboard is proposed at the foot of the Ben Franklin Bridge. The city zoning board approved a controversial proposal for a huge billboard in North Camden at a packed Monday night meeting where residents expressed fears that the 167-foot-high structure would contribute to the city's blight and negatively affect development along the waterfront. The board accepted a variance sought by Cherry Hill-based Interstate Outdoor Advertising because the redevelopment plan for the land at Elm Street and Delaware Avenue, where the billboard would be built, prohibits billboards. "We live here. We will see this 24/7," said Sonia Rivera-Perez of the Cooper Grant neighborhood. "This is not going to be seen in Cherry Hill. This is going to be sorely borne by us, the residents. It changes the landscape." Interstate CEO Drew Katz first floated the proposal in April for two digital screens to target commuters crossing the Benjamin Franklin Bridge, with the roughly $200,000 advertising sales going to Camden nonprofits. The billboard would cost $800,000 and take eight months to construct from the time of final approval, he said. Several conditions were included in the approval, including that Interstate submit its tax returns to the city annually and that all billboard profits always be given to charity even the billboard was sold to another owner. A controversial proposal for a billboard in North Camden drew more than 100 residents to a Monday zoning board meeting. A nonprofit board called Camden Charitable Fund will accept grant applications from neighborhood groups, said Katz, son of philanthropist Lewis Katz. The elder Katz, a co-owner of the Philadelphia Media Group, publisher of the Inquirer and Daily News, died in a plane crash in May 2014. Speaking to board members and residents, Katz said the billboard was his way of honoring his late father, who started the Greater Camden Partnership charity. The first $50,000 in revenues will be pledged to nonprofits in North Camden, he said. Katz said the city could use the billboard to share information about emergencies, such as Amber Alerts, flooding, or traffic. "We don't do this for credit," Katz said. "Every dollar of profit from this billboard will go to Camden nonprofits." Proponents said the billboard proposal would inject needed funding to Camden nonprofits and enhance the work they do. "They all operate off a shoestring budget," Camden pastor Amir Khan said. "This billboard will allow grassroots organizations in Camden to come off life support." Opponents expressed fear that the billboard would harm the quality of life in North Camden, an area of the city that has been rebounding recently. Groups such as Camden Lutheran Housing, the Cooper Grant Neighborhood Association, and Concerned Citizens of North Camden fought the proposal, citing possible light pollution and the lack of a written agreement dictating how proceeds would be spent. The F.W. Winter building is pictured under the Ben Franklin Bridge in Camden. Some local residents oppose the proposed erection of a 16-story digital billboard on the site by Interstate Outdoor Advertising CEO Drew Katz. Opponents also include Cooper's Ferry Partnership, which oversees redevelopment in Camden, and Liberty Property Trust of Philadelphia, which is building the new American Water headquarters and other amenities on the waterfront. Kevin Sheehan, a lawyer representing Liberty Property Trust, applauded Katz for his charitable acts but warned that the billboard would hurt Camden's waterfront development and sights of the Philadelphia skyline. "It is laudable for the Katz family to do a significant amount for the city of Camden. … It's unfortunate that he wants to do so at the detriment of the surrounding neighborhoods," Sheehan said. "All of them will suffer as a result of this billboard." The vote on the variance had been delayed three times as Katz met with community groups to hear their concerns. Stephen Holden, deputy general counsel of the Delaware River Port Authority, which runs the bridge, urged board members to protect the value of the waterfront. "It's ironic to trade the riverfront serenity for money," Holden said.